In a Nutshell: We live in an age of free music streaming and sites of questionable legality offering downloads at no cost. However, not every free download is worthy of taking up precious space on your hard drive. Compiled by notable American free-form radio station WFMU, the Free Music Archive is a legally cleared library of expertly curated, free MP3s created by emerging artists. The number of available tracks is lower than most free-download sites due to FMA’s high-quality standards, but the platform is serving musicians well by giving up-and-comers the exposure that comes with partnering with a reputable site like FMA. For the majority of us music lovers who are watching our spending, downloading free music is an appealing prospect. The problem is that many sites offering free downloads are doing so without regard for copyrights. And sifting through the clutter of no-cost downloads to find quality tracks or recordings can be overwhelming. Many music platforms have vast libraries of free music, but the work uploaded by random artists and bands meets no talent standards. FMA allows users to not only download from a carefully curated pool of quality music, but it gives access to a legal framework for sharing that grants a variety of usage rights, based on what each artist dictates. This makes the site more appealing to budget-conscious filmmakers and videographers, who want to use memorable music in their productions without having to pay the hefty price tag that’s often associated with stock production tracks. 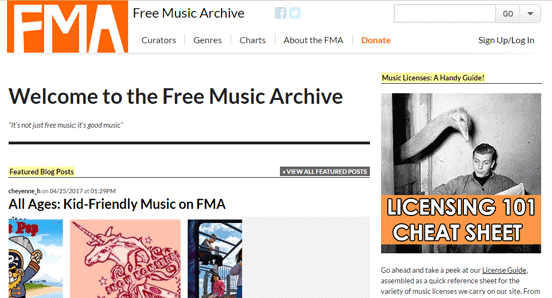 Free Music Archive takes pride in distributing high-quality music to listeners at no cost. “Some of the licenses allow for use in videos and other productions, which is a reason we are popular with filmmakers,” Cheyenne said. When users sign up for Free Music Archive, they become members of a supportive community of artists and music lovers — a destination where curators and artists work together in a way that’s mutually beneficial. One of the problems with free music sharing sites is that artists are often exploited on them. Emerging musicians often can’t afford to protect the rights to their music, and they can sometimes find themselves on sites where the owners or moderators haven’t asked for usage permission. FMA makes every effort to be transparent in its collaboration with the artists featured on the site, and the songs available for download are tracks that the copyright holders have willingly submitted. While free music is always great, it’s even nicer when you’re getting your free music from a site that celebrates artists and is helping to further their careers through exposure. Compared with other similar music sharing platforms, FMA does not have a huge library because not every artist who submits his or her music is invited to participate on the site. Anyone, however, can sign up to use FMA, and, because the music is so carefully selected, the site is heavy on quality versus quantity. 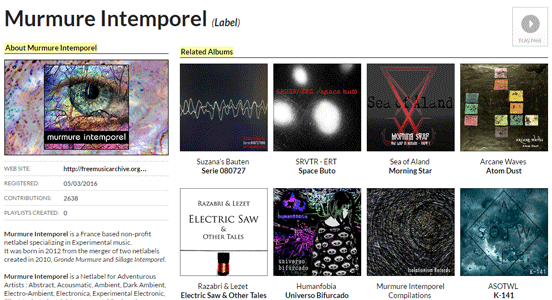 Murmure Intemporel is an example of a netlabel that curates experimental music by emerging artists. By choosing the Curators tab, users can select music that’s specifically dedicated to categories, like video use, along with pages for various radio stations and netlabels. Once you pick your desired page, you’re taken to a page that features more information about the individual curator, along with their approved music. Clicking on an album or artist from this page then leads you to more information or songs on new artists, which just might lead to discovering your new favorite band. Another method for finding music that suits your interests is browsing through genres, where free music categories include electronic, hip-hop, folk, classical, and various others. FMA also charts the most popular downloads so users can quickly find what’s popular on the site from the past week, past month, or all-time. Music licensing exists so artists are fairly compensated when their works is used for commercial purposes. The system protects the artists, and it also helps users understand what they can and cannot use the music for. This is particularly important when dealing with free downloads. 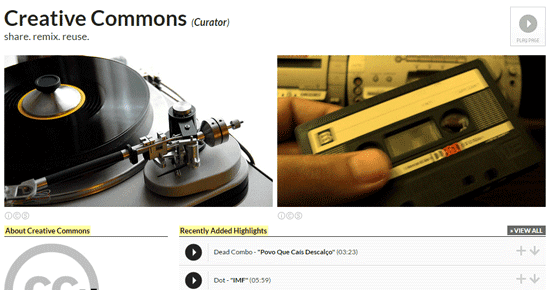 Creative Commons provides free licenses to help simplify the commercial music of tracks on FMA. If you wish to use work that’s covered by the Creative Commons license, you can do so provided you adhere to the conditions of the license. The Free Music Archive does not provide licensing, but the company encourages initiating conversations with artists whenever you’re in doubt. “If someone wants to use a piece of music for something that isn’t covered by its general CC license, we encourage users to contact artists directly to work it out with them,” Cheyenne said. Being on a budget doesn’t mean you can’t download free music while maintaining your integrity. When you download songs by up-and-coming artists on FMA, you’re interacting with a community that celebrates and supports those artists. If you’d like to go further in supporting musicians, you even have the option to make a tax-deductible donation to the site. FMA is always adding new artists and playlists to their queue making it a great discovery tool for new music.